the kids and my wife at the Fine Arts Museum in Boston—I’m throwing away every useless item I see on the floor. All this clutter makes me think of the clutter some job seekers have on their resume. And I imagine the employers feel the way I’m feeling right now. I met with a customer the other day to critique his resume. It was four pages long; but, that’s not what made critiquing it difficult—it was wading through the clutter on it. The first four duty statements were clutter; they added nothing to his resume. The last statement, a quantified accomplishment, said something worth reading. It talked about his ability to lead, which effectively covered the first two bullet points. I asked him about the newsletter to which he contributed articles. He told me it was initially sent via email to 60 partners and customers, and in six months time the readership had grown to 12,000. As well, he wrote two, sometimes three articles a month for it; in which he talked about product releases, offered tips on data storage, and announced tradeshows. He often received favorable reviews from customers, OEMs, and VARs. I suggested that he keep the first duty and elaborated on his group’s productivity, stability, and endearing affection for him. He admitted that 10 of the 25 sales people and half of the office staff had to be let go because of downsizing. However, productivity wasn’t affected; rather the reduced team maintained and even surpassed projections set by upper management by 25 percent. The bullet points on leading meetings and hiring and firing employees were clutter, much like the coffee cups sitting beside me on my office desk. Trash these I told him. A bazillion managers lead meetings, and many are responsible for hiring and firing employees. So what. * Reduced sales force by 40 percent due to budget restraints, while surpassing productivity expectations by 25 percent. * Spearheaded the company’s first pay-for-service program which increased sales 30 percent and earned the sales department an Award of Excellence. * Authored articles for the company’s monthly newsletter, announcing product releases, providing tips on color management, and promoting tradeshows; increasing readership from 60 to 12,000 in just six months. 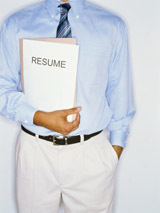 • What Happens After You Submit Your Resume?